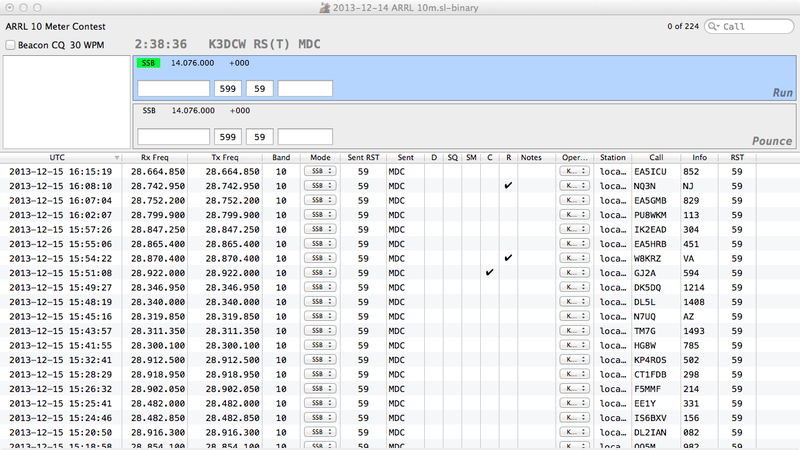 Bill Myers, K1GQ, released version 2.2.6 of his contest logging software SkookumLogger for macOS. Enabling/disabling SkookumNet is now managed by a checkbox in Logging preferences, simplifying the use of the networking feature. A Rate column has been added to the table in the SkookumNet window, showing the last-ten rate in QSOs per hour. The Rate Tracker window must be open on the corresponding host computer in order to compute the rate. Thanks JH5GHM. For WRTC logs, when the Refuse to log any QSOs option is selected in Logging preferences, all out-going SkookumNet communication is disabled. This is termed Referee mode — it allows the referee to monitor the log on a separate computer while preventing any accidental changes. Excessive redraws of the Great Circle Map were discovered and eliminated. The effect was sporadic variations in keyboard responsiveness. « WSJT-X v1.9.0 released	» RUMlogNG version 3.12.2 released.